Shirts With Random Triangles: Oregon adds four-star JUCO CB prospect Elijah Blades to its 2019 football recruiting class. Oregon adds four-star JUCO CB prospect Elijah Blades to its 2019 football recruiting class. Elijah Blades. Image via The Lincoln Journal Star. Oregon has added a seventeenth member to its 2019 football recruiting class. Pasadena, Ca. 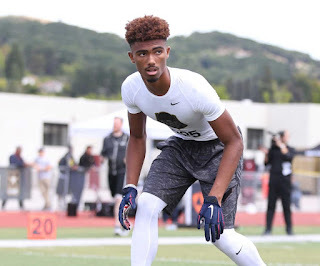 JUCO cornerback prospect Elijah Blades announced his commitment to the Ducks on Wednesday. Blades had previously committed to Nebraska in 2017, but academic issues prevented him from entering school there. He then enrolled at Arizona Western College in Yuma, Arizona. 247Sports grades Blades as a composite four-star JUCO cornerback prospect. The recruiting site’s composite JUCO prospect rankings for 2019 rank Blades at no. 2 among JUCO CB prospects, at no. 2 among JUCO prospects from the state of California, and at no. 7 among JUCO prospects nationally. Blades attends Arizona Western College in Yuma, Az. He attended John Muir High School in Pasadena, Ca. He stands 6’2, and weighs 170 lbs.